Fool’s Gold teamed up with Seattle’s Alive & Well for a limited edition capsule celebrating the brand’s four-year anniversary. With shared roots in music and street culture (longtime FG fam Four Color Zack is one of A&W’s founders) and a mutually irreverent take on style, this team-up channels inspiration from Seatown weather, Sir Mix A Lot’s limo, and more into must-have pieces for Spring. 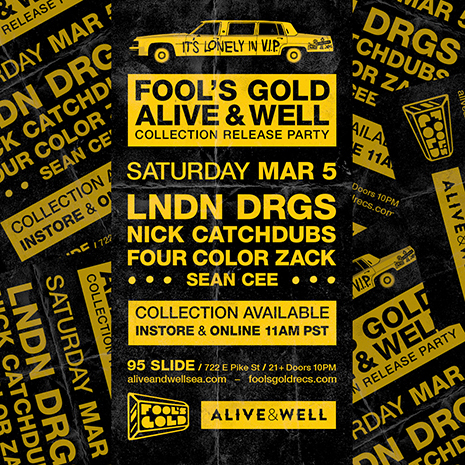 Get the tees, hoodies, rain jacket, skate deck and more starting this Saturday (3/5) at store.foolsgoldrecs.com and aliveandwellsea.com, and celebrate with a FG takeover that night at 95 Slide (722 E. Pike Street) featuring music from LNDN DRGS, Nick Catchdubs, Four Color Zack and Sean Cee. Gladiator can’t stop moving. High-powered sets around the globe have earned lifelong LA friends Daniel Goodman and Ian Johnson an international #SQUAD of loyal fans, while dance superstars (Skrillex, A-Trak, Major Lazer) and urban upstarts (Kehlani, Kid Ink, Dej Loaf) keep calling for the duo’s magic touch on remixes and collaborations. It’s been a whirlwind trip so far, but Gladiator’s new Transit EP is a true milemarker: deeper songwriting, crazier sonics, and an even stronger distillation of that Gladiator spark. They channeled all the adventures of a non-stop life into five very cool, very chunky original tracks, with fellow journeymen Vindata, Four Color Zack and more coming along for the ride. Won’t you join them? Listen to Transit now! Gladiator can’t stop moving. High-powered sets around the globe have earned lifelong LA friends Daniel Goodman and Ian Johnson an international #SQUAD of loyal fans, while dance superstars (Skrillex, A-Trak, Major Lazer) and urban upstarts (Kehlani, Kid Ink, Dej Loaf) keep calling for the duo’s magic touch on remixes and collaborations. 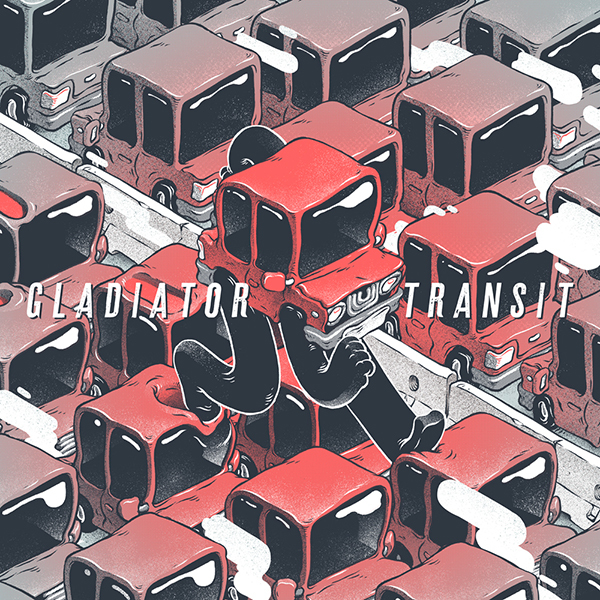 It’s been a whirlwind trip so far, but Gladiator’s new Transit EP (out 1/22) is a true milemarker: deeper songwriting, crazier sonics, and an even stronger distillation of that Gladiator spark. They channeled all the adventures of a non-stop life into five very cool, very chunky original tracks, with fellow journeymen Vindata, Mark Johns, Four Color Zack and more coming along for the ride. Won’t you join them? Listen to “Wait” feat Four Color Zack at Complex, and pre-order the full EP now! Our bros Craze and Four Color Zack got something to say! Their new 2¢ megamix takes a stand against fakers, perpetrators, button-pushers, “DJ list” cornballs and finesse-deficient individuals everywhere! But this is no polemic: 2¢ is a fun listen throughout, packed with hype bits, inside jokes, and tons of wicky wicky wicky. Download it now, peep FCZ’s Slap It Down EP with DJ Scene for more jams (cop some #REALDJING merch from us while you’re at it!) and catch Craze tonight at Verboten in Brooklyn with The Rub, DJ Wonder and Sammy Bananas for all your weekend party needs. Get tix here! FCZ demolishes the EPK game with a hilarious new animated clip featuring testimonials from A-Trak, Flosstradamus and more intercut with his personal DJ history lessons and a paternity test courtesy Mannie Fresh. 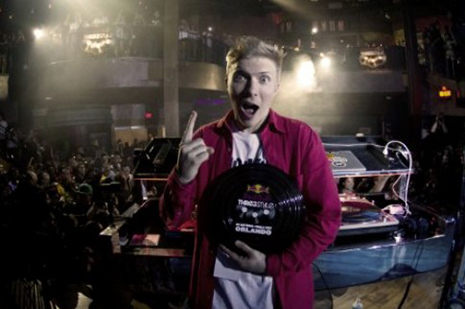 Seriously, must be seen to be believed… then go cop his new Slap It Down EP with DJ Scene. 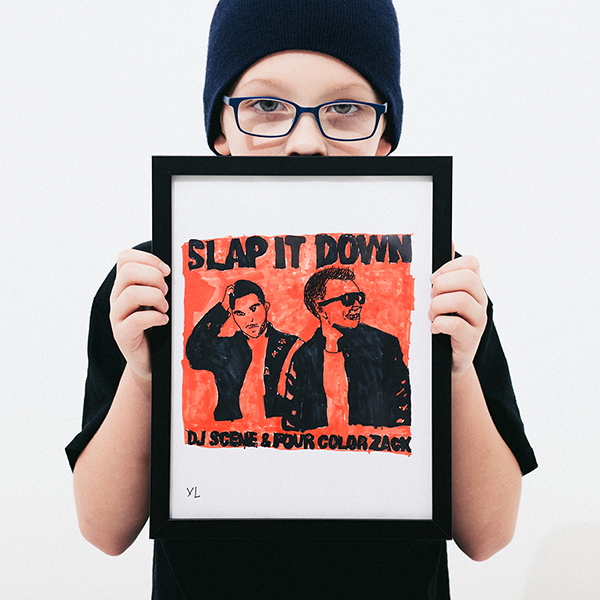 DJ Scene & Four Color Zack “Slap It Down” Out Now! POW! DJ Scene and Four Color Zack combine forces for the new Slap It Down EP, out 3/10. Pre-order now on iTunes and get the title track featuring M.O.P. (!!!) premiered today by Entertainment Weekly alongside the EP cover art by Scene and FCZ’s Seattle neighbor Yung Lenox. Hoard! 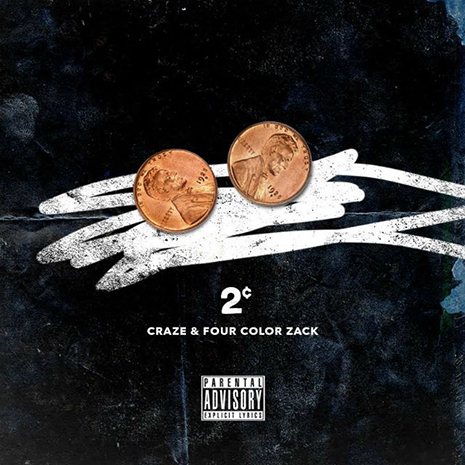 Tags: DJ Scene, Four Color Zack, M.O.P. 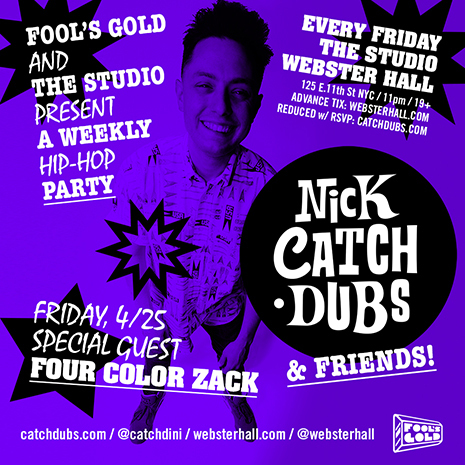 Nick Catchdubs’ weekly Webster Hall Studio residency continues this Friday (4/25) with special guest and longtime FG homie Four Color Zack. Don’t miss it! _blanK”>RSVP for reduced entry and download Catchy’s latest Nick Catchdubs & Friends DJ mix here. 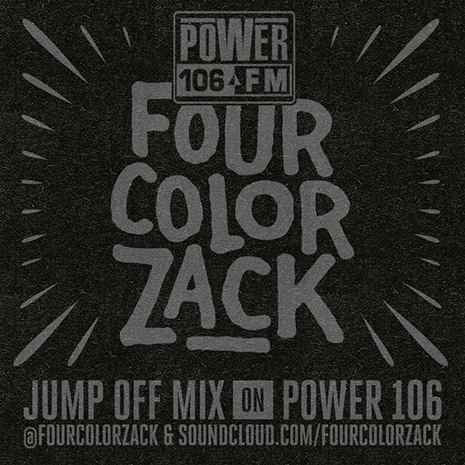 DJ champ and longtime FG homie Four Color Zack gets extra busy with his new mix for Power 106’s “Jump Off” series, freaking all manner of radio and club fodder as only he can, including Donnis’ body mover from our Loosies comp, “Knockout” (produced by Cadenza). Check it out!